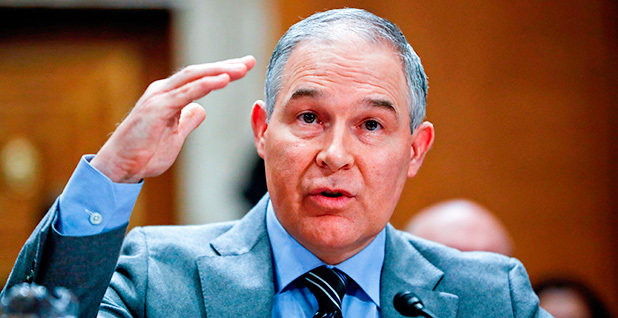 "It reflects the ignorance of this administration with regards to science and the degree it will go to reject the skills of its own high-quality employees," said Jim McCargar, a former senior policy adviser on EPA's car program. "It's just flat-out wrong." The agency's paperwork yesterday marks the start of a new rulemaking process that's expected to take months. Officials with EPA and the National Highway Traffic Safety Administration, which shares regulatory oversight on fuel economy, will hammer out a detailed proposal for cars made between 2022 and 2025. Those talks, along with negotiations involving California, will determine the course of the most significant effort to tackle greenhouse gas emissions from mobile sources. Vehicles overtook power plants as the nation's largest contributor of carbon dioxide emissions last year. Under Administrator Scott Pruitt, EPA has sought to undo federal rules limiting emissions related to climate change. The corporate average fuel economy, or CAFE, standards were seen as a major step to address climbing temperatures under former President Obama. Now they're considered financially onerous. "Based on our review and analysis of the comments and information submitted, and EPA's own analysis, the Administrator believes that the current [greenhouse gas] emission standards for [model years] 2022-2025 light-duty vehicles presents challenges for auto manufacturers due to feasibility and practicability, raises potential concerns related to automobile safety, and results in significant additional costs on consumers, especially low-income consumers," says the EPA document released yesterday. The notice builds the case for rolling back the climate program, but it provides few new details or analysis. The language went through several contested drafts before being published on the agency's website late yesterday. It refers to studies funded by automakers, estimates from companies and reports that have been questioned by most researchers. "Rather than pointing to the fact that these standards are cost-effective for consumers, that we have the technology to meet and exceed these standards by 2025, and that these standards have tremendous positive impacts on the economy, the ideologues currently at the EPA have decided to ignore this evidence and misconstrue how the standards work," Dave Cooke, of the Union of Concerned Scientists, wrote in a blog post yesterday. The document relies heavily on arguments provided by automakers — primarily the Alliance of Automobile Manufacturers, the powerful trade lobby pressing for a reconsideration of the rules. It makes broad claims that changes in market conditions, like long-lasting low gas prices, and consumers' growing preference for trucks and SUVs justify a change in the rules. To gather more data, EPA promised to "explore new analytical tools to look at new vehicle sales and fleet turnover as part of its decision-making record for the new rule." The document also cites safety concerns from smaller cars. That's significant because it offers an opening to NHTSA, the Transportation Department agency tasked with extending mileage and saving lives, to lower the targets. Americans' tepid embrace of electric vehicles also played a role in the decision. The document includes a figure from the Association of Global Automakers showing that sales of electrified vehicles have gone down since 2013. The document says that "calls into question" Obama-era projections about EVs. In the past, EPA expected automakers to meet the rules even if sales of plug-ins remained below 10 percent. That's because the rules are designed to force improvements in internal-combustion engine technology, not mandate sales of a type of vehicle. In one example, the document cites a study by the Center for Automotive Research that estimated the standards could cause the loss of 1.13 million jobs if they increased the price of a car by $6,000. Ford Motor Co.'s then-CEO, Mark Fields, mentioned that number to President Trump directly last January. But it's a worst-case scenario. Environmental and automotive research groups said the study was not credible. Most estimates, including EPA's, put the cost of the standards at less than $2,000 per vehicle.